The Keep Bridge Alive project hopes to transform the image of bridge, increase participation and enhance sustainability of our favourite mind sport. 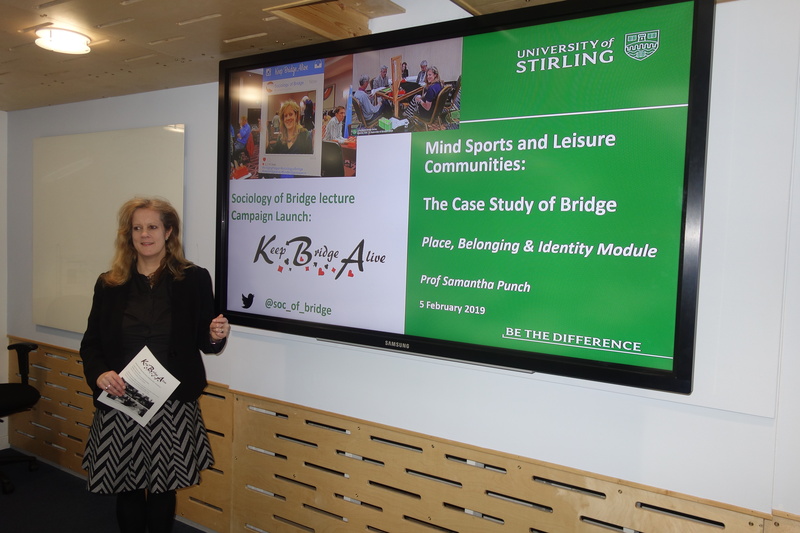 Alex Coyne spoke to Professor Samantha Punch (top photo) at University of Stirling about her research and the Keep Bridge Alive Campaign – and the interview is published below in complete form, because the answers were just too good not to! Read more about the Keep Bridge Alive Campaign, how it looks to impact bridge and how people can get more involved with the initiative. Great Bridge Links: What’s at the core of the Keep Bridge Alive campaign? Professor Samantha Punch: The core of Keep Bridge Alive is to attract new players to the game and to grow the bridge population throughout the world. Globally there are not enough younger players coming through and we’re all getting older. The average age of bridge players is getting higher and some clubs/tournaments are struggling to survive. We need to think more creatively about how we are going to reproduce the next generation of players and keep bridge alive. Great Bridge Links: Tell me more about the PhD research you’re hoping to conduct. Professor Samantha Punch: We would like to conduct an academic study which demonstrates the skills that children develop when learning bridge. This would include teaching bridge to one class of children and having a control group of another class of similar abilities/backgrounds etc who do not learn bridge. This research could be carried out at two different schools using contrasting socio-economic locations. The children would be tested for various skills at the start of the year and again at the end of a year of learning bridge (or not having learnt it). Interviews with the children, teachers and parents would also be conducted to explore their perspectives of the impacts of learning bridge across a range of benefits, including life and transferable skills. As a three year doctoral research project it would provide robust evidence of the skills gained (partnership, team and individual skills) as well as the improved test results that we predict are possible. The findings would be used to encourage schools and governments to invest in bridge. Great Bridge Links: A lot is said about the sociology of bridge. How has the player demographic changed over the past few decades/years? Professor Samantha Punch: I’ll start with some specific examples of the changing age profile of players. 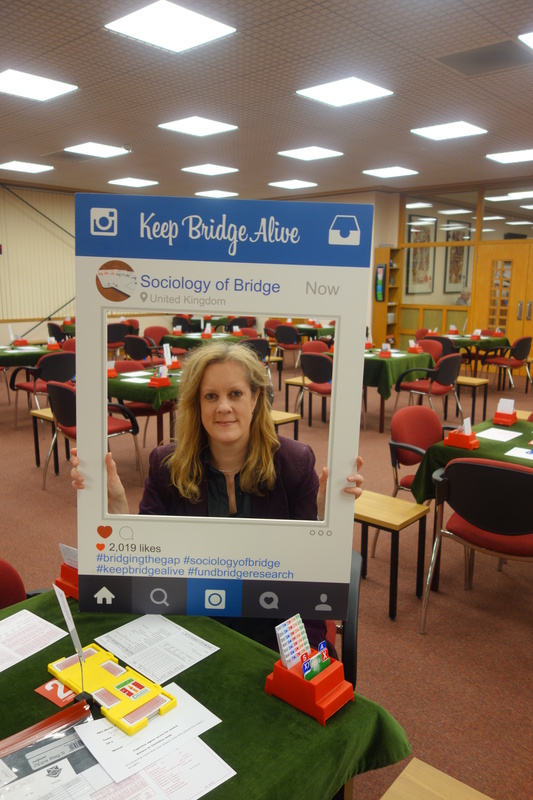 I am teaching the Sociology of Bridge in one of my undergraduate modules at the University of Stirling. When I asked the 60 students (mostly around 21 years old) if they had heard of bridge before my lectures, only one had! To me, that is shocking and would not be the same if I asked about chess. We need to make bridge popular again and raise its profile in society. In 1974 there were 249 bridge clubs and 10,500 bridge players in Scotland, today despite an increase in the general Scottish population, there are only 120 clubs and 5,800 registered members. Keep Bridge Alive has been initiated in Stirling in Scotland where a local club Alva recently closed and the nearby, once vibrant, club of Falkirk is on the brink of closure – it used to fill two rooms with bridge players, now it has just two tables. Professional bridge brings both positive and negative effects and it would be useful to see how the benefits could be enhanced whilst the downsides minimised. Another interesting dynamic that I would like to explore more is the impact of the professionalization of bridge over the last twenty years. Professional bridge brings both positive and negative effects and it would be useful to see how the benefits could be enhanced whilst the downsides minimised. Similarly more work could be done to make bridge more inclusive and welcoming for players of all ages, such as by addressing gender inequalities as there tends to be a higher drop-out rate of young female players. Thus, I know I could easily fill the remaining 15 years of my academic career doing sociological research and working collaboratively with other academic disciplines and organisations across the world to Keep Bridge Alive. This KBA campaign is the first step in making that happen which is why it is so important that we reach our Crowdfund target. Great Bridge Links: What’s the current image of bridge? How has it/should it change? 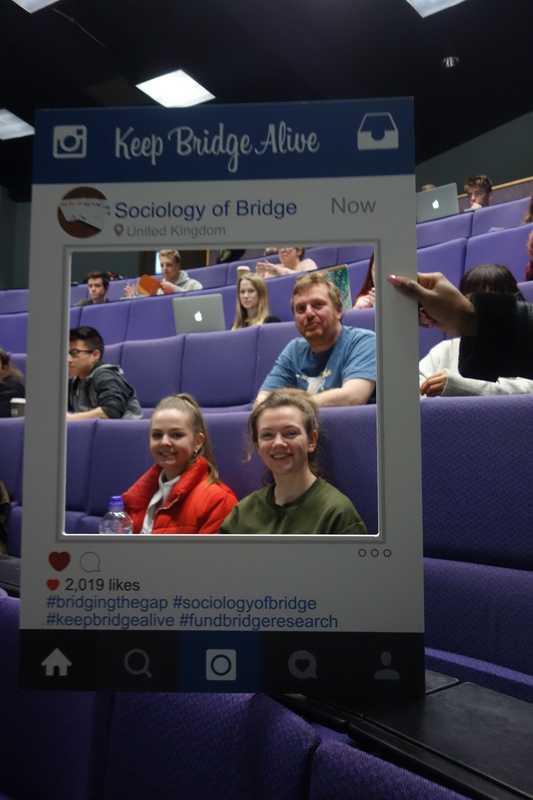 Professor Samantha Punch: The Keep Bridge Alive work needs to include collaborative efforts to transform the image of bridge because bridge tends to be perceived quite negatively in society. We have started to do some research on this, and the views of bridge so far link to assumptions that it is a game only for older people. Many do not realise that it is a fun, exciting, challenging and competitive game that can provide an adrenalin rush as well as being extremely social. Some governments also think it is a gambling game, which is why they prefer to invest in chess rather than bridge. Some governments also think it is a gambling game, which is why they prefer to invest in chess rather than bridge. However, it will take time to re-brand bridge, so we need to work together to Keep Bridge Alive – getting people around the world to collaborate and share ideas to really tackle this issue and get bridge on the map and into the media. The first step is that we need evidence to establish the credibility of the new academic field of the Sociology of Bridge. Part of that is to develop publicity and promotion of the game, which will help shift the traditional image of bridge as an unexciting passtime. Instead, it will become known as the thrilling game we love. Professor Samantha Punch: As bridge players we know how great a game bridge is and the Keep Bridge Alive project can help to get the message out that bridge is good for skill development, healthy ageing and social connection. Our aim is to generate sociological research evidence which can then be used to convince schools, universities, workplaces and communities that setting up opportunities to learn bridge is beneficial to improving people’s well-being and mental health. Our aim is to generate sociological research evidence which can then be used to convince schools, universities, workplaces and communities that setting up opportunities to learn bridge is beneficial to improving people’s well-being and mental health. Sociological research can show the benefits of bridge for people of all ages. In particular we are keen to develop family approaches to the game and thus help to ‘bridge the gap’ between the generations. Nowadays young people spend so long on their phones and tablets that traditional ways of communicating are being lost. Bridge offers an interesting solution to encouraging parents and children, or grandparents and grandchildren to get together and have fun. The Keep Bridge Alive campaign will develop innovative and collaborative approaches to attracting new players to our game (including targeted resources aimed at children, young people, families as well as policy-makers, employers and teachers). Keep Bridge Alive is about taking action to share best practice, pool resources and develop an evidence base to re-brand and grow the bridge world. This an excellent opportunity to do something different and create momentum for change within and beyond the bridge community. Great Bridge Links: Bridge is excellent for keeping the brain sharp. A sentence or two about the links between bridge and combating dementia – and why it’s bridge that does it? Professor Samantha Punch: A key benefit of bridge is the social contact it provides at many levels – partnerships, team-mates and the wider bridge community – a network of players who look out for each other, both within and across generations. Whilst we are not yet in a position to say with certainty that bridge combats dementia, there is evidence that social connection is more important than diet or exercise in terms of living a longer, more fulfilled and healthy life. Bridge is a stimulating card game which provides both cognitive and social benefits – we need human interaction and mental exercise as much as physical exercise to live well. Thus, as a meaningful activity, bridge is likely to have positive outcomes for delaying the onset of dementia, but further research in this area is required. Great Bridge Links: If there’s anything you’d like to add I haven’t covered, please include here. Professor Samantha Punch: To sum up, the key goals of the Keep Bridge Alive project are to transform the image of bridge, increase participation and enhance sustainability of the mind sport. It is a Crowdfund campaign and we need the bridge crowd to get behind this, otherwise without funding, the work simply cannot be done. Every donation is vital as it shows that the bridge world cares about its future. If just one in 25 bridge players throughout the world donated £10 (12 euros or 13 US dollars), we would quickly and easily reach our target of £45,000 (60K dollars or 52K euros).